Safety rail system, series 22. Approved to European Union standard. 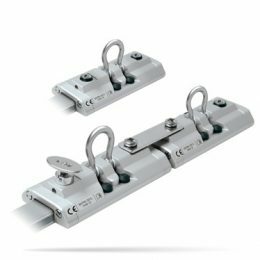 • All safety rail systems are certified to meet European Standard EN795; 2012; Type D.
• Marine grade aluminum alloy cars, safety rail tracks and end stops, anodized for corrosion protection and long service life. • Recirculating Torlon® ball bearings for free running, low friction performance and low maintenance. • Grade 316 forged stainless steel pivoting shackles for lanyard attachment. • Rubber buffers for reduced vibration and to lift pivoting shackles away from car body for quick access. • Spring-loaded stainless steel plunger for simple, positive re-positioning at stop locations. Can be locked in the disengaged position to allow free movement along the track rail. The elliptical knob is easy to grip and turn, and indicates clearly whether the plunger is engaged or not. • Safety rail system track rail can be mounted in either a vertical or horizontal plane as shown below.